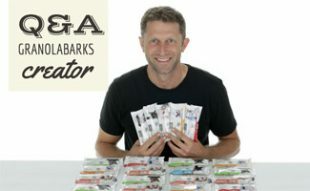 In 2007, I created a business to make custom dog collars and leashes for internet shoppers. As we celebrate ten years online, I could not be more proud of how Canine Journal has transformed and grown into this wonderful web community! And it is in no small part thanks to each and every one of you. Together we have made Canine Journal the premier resource for all things dog and have helped pet parents make better decisions that enhance the lives of their pets. Thank you for all your puppy love and support! 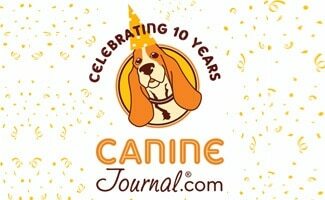 It means the world to me and to our whole team here at CanineJournal.com! To celebrate a decade of dog-related content, we asked our fans to submit photos via ShortStack of their dog to be featured on our site. 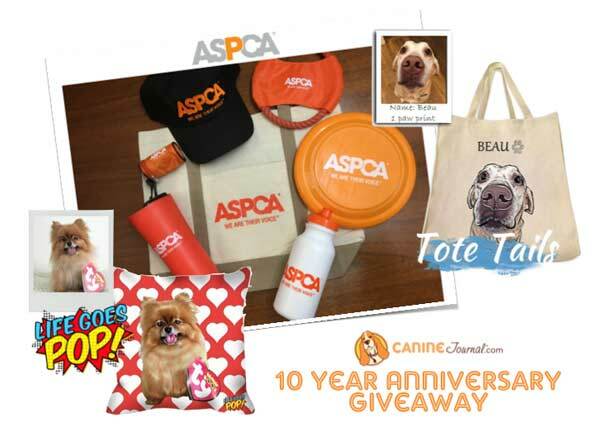 The dog with the most votes wins a customized prize pack including a Tote Tails bag, a personalized pillow from LifeGoesPOP and an ASPCA gift pack! (Read more about our partners below). Well, the results are in and, drum roll please, we have a winner (or should we say “weiner”)? 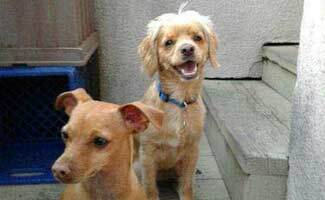 Congrats Mya (Chihuahua) and Bleys (Cocker Spaniel/Cavalier King Charles Spaniel)! Here is the award-winning photo and story of the winning dog(s). We wanted to give a big shout out (and head pat) to our sponsors who provided the prizes for our birthday celebration. They’re two U.S.-based small businesses and one not-for-profit organization that we respect a great deal. As a bonus, they also have some great gift items and ideas to share with your readers. Learn more about each below and check out their websites for more info. What better way to show off your dog to the world than with a customized dog tote bag. 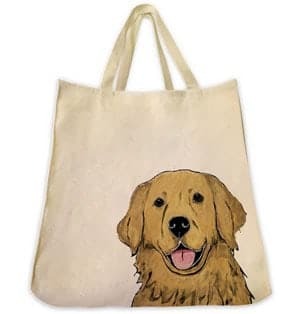 All you have to do is send Tote Tails a picture of your pet and their artists will create an illustration, photo or outline of your pet on a 15.5″ x 16.5″ x 7″ canvas bag. These custom gifts are made in Northern California and manufactured in the United States from eco-friendly reusable cotton. And best of all, 10% of every purchase benefits the ASPCA (one of our other partners) or the Humane Society. For only $49, Tote Tails makes the perfect bag for doggy overnight trips or to take to the dog sitter. Looking for another unique gift idea for your dog-loving friends? 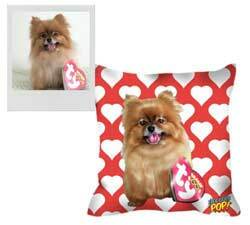 Just upload a photo of your pup and the LifeGoesPop team of experienced artists will hand draw and send you several pop art designs from which to choose. Once you have picked your favorite image, the team at LifeGoesPop will print it on a 18×18 inch plush pillow to be sewn in California. The polyester and cotton fabric blend makes the colors pop, and the machine-washable pillow has a concealed zipper, so your pooch doesn’t get snagged. The company stands behind its customer service and makes other custom gifts including blankets, tanks, phone cases or even just the art on its own. Since 1866, the American Society for the Prevention of Cruelty to Animals® (ASPCA®) has been helping give pets second chances and ensuring that animals are entitled to the same treatment as humans. They were the first humane society in North America and are now the largest in the world. Based in New York City, the ASPCA has anti-cruelty programs across the country. 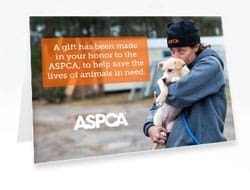 The ASPCA is a non-profit organization, so every dollar from their 2 million supporters goes straight to helping dogs in need. Consider making a donation. Then you can read our interview with the ASPCA CEO and learn more about ASPCA pet insurance. You can also visit their site to find a local adoption shelter and see all the adorable available pets you will find there. A dog’s life expectancy can range from six to 17+ years, but we hope our website will even outlive them so we can continue bringing our readers product reviews, tips, news and resources to help them be better pet owners for many years to come. And thanks to each of you for your unwavering support — we sometimes pinch ourselves for the opportunity to do what we do every day. We look forward to continuing to entertain and educate pet parents everywhere, one article at a time. Love, Michelle and the Canine Journal team! What do you love most about Canine Journal? Disclaimer: Information regarding insurance company offerings, pricing and other contract details are subject to change by the insurance company at any time and are not under the control of this website. Information published on this website is intended for reference use only. 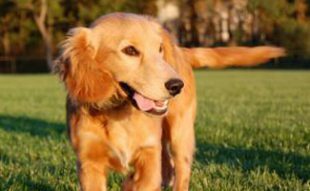 Please review your policy carefully before signing up for a new pet health insurance contract or any other contract as your unique circumstances will differ from those of others who may be used for example purposes in this article. 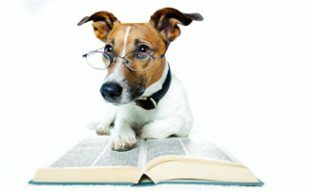 Want to Be a Doggone Writer?